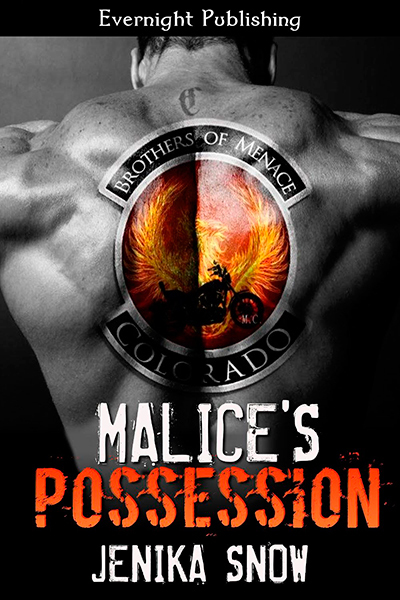 Trevor “Malice” Mason once had an old lady, and he doesn’t need another one. Taking care of his son and being there for The Brothers of Menace MC are what is important to him. The only kind of female company he needs is the one that can warm his bed at night. Adrianna Carmine has led a tough life, but she is a survivor. When she allows herself to fall for the saccharine falseness of comfort from her now ex-boyfriend, her only escape is to either die trying, or kill the man that exacts pleasure from hurting her. When Malice finds Adrianna wounded and alone, protecting her consumes him. After delivering retribution to the one that hurt her he takes her back to River Run, hoping that she can heal. But Malice wants her something fierce and staying away isn’t an option, even if she deserves better.